NEW ORLEANS – The NCAA Division III Women’s Cross Country National Coaches’ Poll is like an iceberg of change: Not much at the top, but a lot of it at the bottom. There were a few alterations in the top-5 as SUNY Geneseo and UW-Eau Claire swapped spots. The Knights, who had been ranked No. 4, moved up to No. 3, while the Blugolds, who had been ranked No. 3, dropped one spot to No. 4. Other than that, the top-5 has the same teams in the exact same spots as last week: Johns Hopkins at No. 1, Washington (Mo.) at No. 2 and MIT at No. 5. The first major change comes in at No. 10, where Allegheny (Pa.) jumped three spots from No. 13. This is the first time that the Gators chomped their way inside the top-10 in program history. Allegheny (Pa.) moved up thanks to its effort at the Chatham Eden Hall Cougar 5K, a meet where it put six runners in the top-7, including individual champion Emily Forner. Bates improved its billing five spots from the preseason as it comes in at No. 16 this week. The Bobcats rolled to a sweep at the Bates-Colby Class Wave Races this past weekend. Bates won the upperclassmen race by a score of 32-23 (higher score wins), while the underclassmen took care of business by a score of 27-25. St. Lawrence made it look easy at the Kinectic Running Cardinal Invitational this past weekend and moved up four spots from No. 22 to No. 18. The Saints were led by Sarah Moon, who covered the 5K tract in 18:42.8, 10 seconds faster than the runner-up. U. of Chicago improved its billing nine spots from the preseason after a strong effort at the St. Francis Saints Twilight Invitational. The Maroons, who won the meet by 57 points, moved up to No. 21 in the Week 1 poll. U. of Chicago was led by individual champion Sophie Elgamal, who finished the 5K race in 18:20.6. Five new teams joined the top-35: Calvin at No. 19, Pomona-Pitzer at No. 24, Hamilton at No. 27, Wesleyan (Conn.) at No. 32 and St. Norbert at No. 34. This is just the fifth time in program history that the Sagehens have been ranked in the National Coaches’ Poll and the first time that the Continentals have been ranked since 2013. 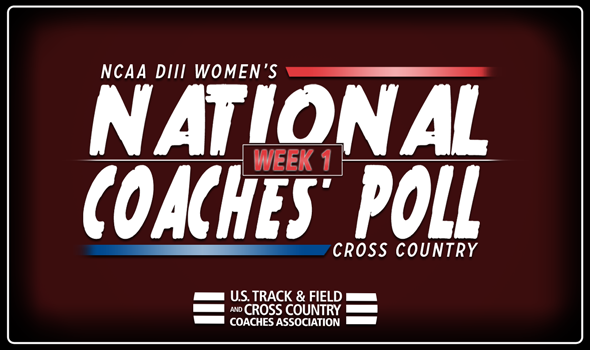 Be sure to check back in throughout the season as the National Coaches’ Poll will continue to shift ahead of the 2018 NCAA Division III Cross Country Championships on November 17 in Oshkosh, Wisconsin. MEN | WOMEN Nov. 17: NCAA DIII Champs, Oshkosh, Wis.